Greenbiz 2012 Report Says That U.S. Sustainable Business Has a "Recessionary Hangover"
Greenbiz.com recently released their free, downloadable “State of Green Business 2012” report and some of the statistics are quite surprising. The report begins by explaining the stalemate on green progress by saying that “…sustainable business is suffering a recessionary hangover.” The study goes on to look at 20 key indicators, such as organic agriculture, e-waste, and toxic emissions, to determine whether US businesses are “swimming”, “sinking”, or “treading water”. With 80% of the indicators getting a “Tread” or “Sink” rating, this is a big wake up call that most big companies are not doing their part to make progress towards a sustainable future. In 2011, as legislative bodies stalled repeatedly over enacting a proposed federal strategy, 2.44 million tons of e-waste was disposed in the US and abroad. Discarded electronics pose a major health risk when dumped in a landfill, and with technology advancing so quickly, and our consumer want for the newest and greatest, we are creating gadgets that are practically landfill ready only months after they hit store shelves. The silver lining is that there are several manufacturers, such as Dell, pledging to take voluntary action against e-waste. There are also activist groups like Basel Action Network that are keeping this issue at the forefront of national policy for 2012. We have also had a HUGE setback in toxic emissions and toxics from manufacturing. “Total emissions to air, soil, and water of 27 chemicals that are most prevalent in manufacturing EPA’s Toxics Release Inventory increased a whopping 78 percent from 2009 to 2010, attributed primarily to much larger releases of lead, arsenic, and asbestos.” Softening of regulations in order to allow businesses an attempt at profitability, mostly in metals manufacturing and mining, have been the source of much of this toxic leaching. Sustainable Consumption is getting traction due to the efforts of several front runners in sportswear, electronics, and automotives. Buy back programs, and incentivizing to only buy what you need have been modeled this year by Patagonia’s campaign that encouraged selling of second hand branded wares through their partner for challenge, Ebay. Highlighted in the report are other pledges from from other sportswear manufacturers, like Puma and Nike, to reduce, reuse, and consider materials. The report also highlights examples of service models of ownership, such as Best Buy’s subscription program that offers a buy back for electronics within two years after purchase. Vehicle sharing has held strong due to the efforts of companies like ZipCar. Sited in the report are examples of major car manufacturers, like Ford and GM, partnering to strengthen the access to ride share programs. There are also a slew of smaller start-ups mentioned in the report with unique models for sharing products, and consuming less, but it nice to see that a few mega players are also getting noticed in this area. Cleantech is still holding strong with a “Swim” rating from Greenbiz. “Cleantech is maturing, growing, and doing reasonably well. In 2011, for the first time, power plants operating on solar, wind, and biomass energy garnered more investment than those powered by natural gas, oil, and coal—$187 billion for renewables compared to $157 billion for fossil fuels, according to Bloomberg New Energy Finance.” Although some green tech companies are failing, this can be seen as a positive sign of the natural progression of technology becoming more mainstream. The report points to politics as the main reason that cleantech and alternative energy production has not progressed even further forward this year. From mega energy renovations at the Empire State Building to the positive impact from US Government mandates for efficiency in their facilities, high marks for building efficiency are popping up on high profile projects everywhere in the US. On a micro level, energy control is also on the up and up with home use products to manage power and temperature such as EcoBee and GE’s Nucleus. Looking at the wider scope, many cities are doing a great job to pledge to energy efficiency by laying out plans under the C40 Cities Climate Leadership Group. Transparency and accountability measures are becoming more defined as data collection advances. Sustainability reporting, although still optional for big business, has become as normal as expected as reporting earnings. “There’s not necessarily a legal mandate for companies to disclose such things, but a growing number are doing so, pushed by institutional investors, customers, activists, and others.” In addition to footprint accountability from businesses, advances in data collection technology embedded in everything from buildings, to vehicles, traffic signal, and even your credit card transactions can allow for more analysis on the way we live. 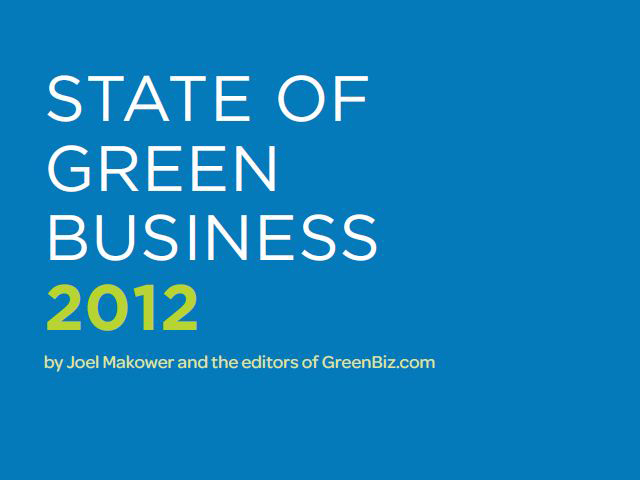 Greenbiz.com recently released their free, downloadable "State of Green Business 2012" report and some of the statistics are quite surprising. The report begins by explaining the stalemate on green progress by saying that "...sustainable business is suffering a recessionary hangover." 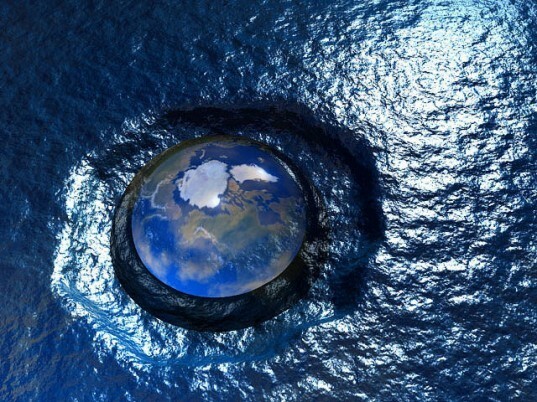 The study goes on to look at 20 key indicators, such as organic agriculture, e-waste, and toxic emissions, to determine whether US businesses are "swimming", "sinking", or "treading water". With 80% of the indicators getting a "Tread" or "Sink" rating, this is a big wake up call that most big companies are not doing their part to make progress towards a sustainable future.